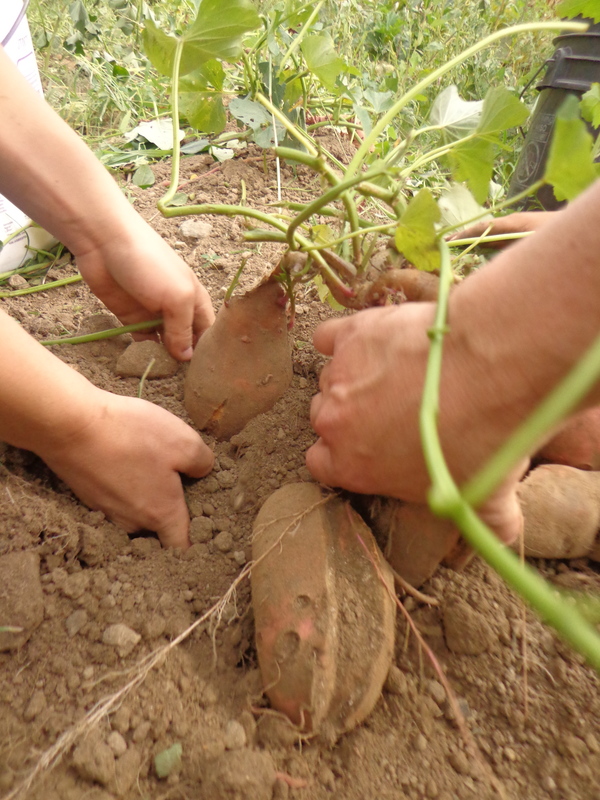 As the leaves on the sweet potato vines began to change color, we realized it was time to pull up those tasty spuds! There’s always a fine line between getting a maximum harvest without losing some of that harvest to critters who like to try to snack on them before we dig them up! I think we got it just right this year! 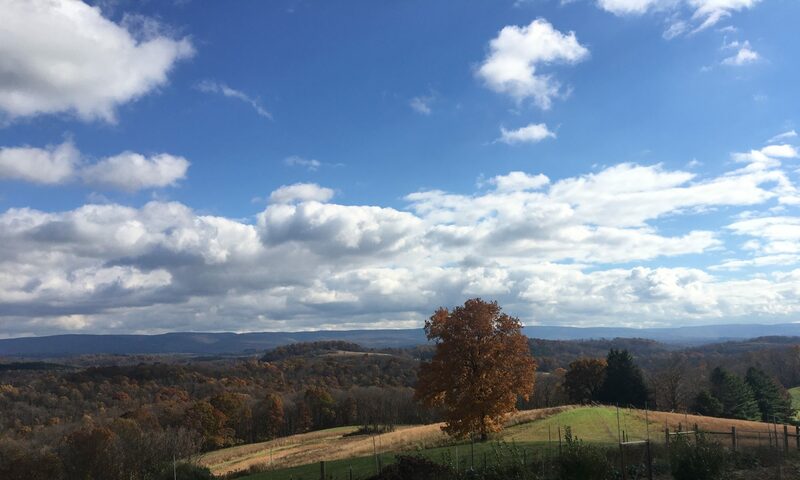 Today was an optimal day for harvesting – cool and overcast. 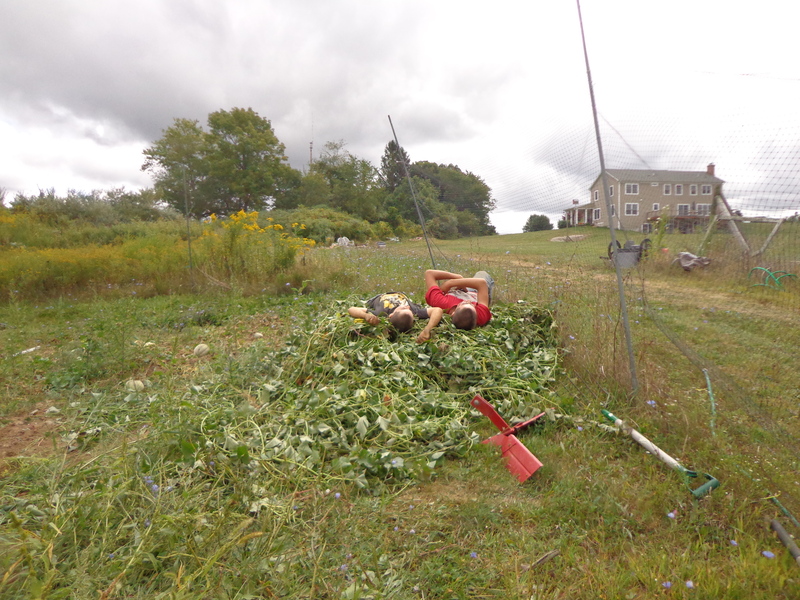 We got to work with 2 boys cutting vines and piling them up – you’ll see what that pile was for later – and 2 of us digging while a couple more kids did the final unearthing and harvesting. You never get tired of digging potatoes. It’s like an archaeological site sometimes! You just don’t know what you’re going to find as you brush the dirt away! How big will it be? How long? What amazing shape will you find? And you have to be careful with those pitchforks, because like an archaeological find, these babies are precious and we don’t want to break or pierce them! Which yielded a record harvest! Midway through the weighing process the scale got bumped by the boot of a child who shall remain nameless, so we had to guess the total weight based on each bucketful being 20 to 25 pounds. 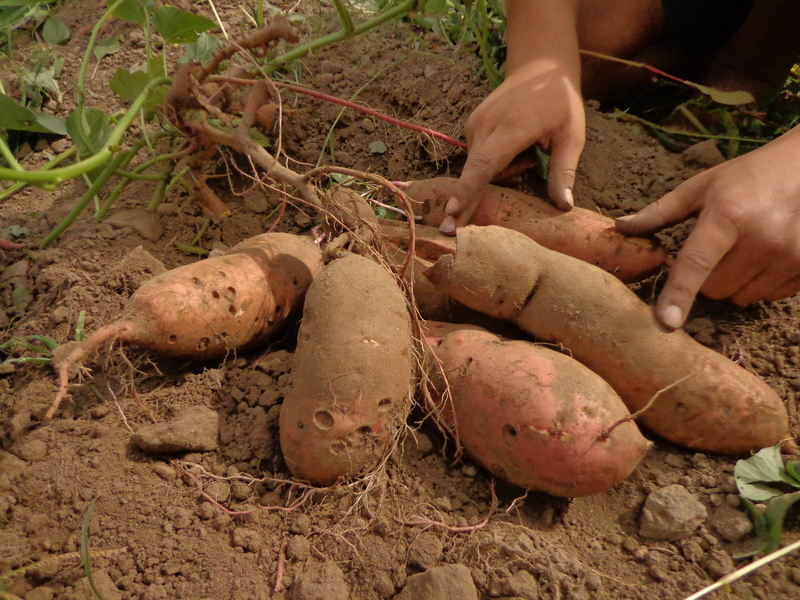 This year we calculate a harvest of well over 500 pounds of Beauregard sweet potatoes! They must be cured for 4 to 6 weeks to maximize the sweetness. It’s best that they be in a somewhat warm, humid environment which is hard to find this time of year. The best we could do was put them in our Jacuzzi! Normally we half fill it with our sweets- this year we would have overflowed it! Full, with 2 bags remaining! Oh yeah — and what was that mound of harvest vines to become? A place for a few exhausted children to collapse upon at day’s end! Finally! 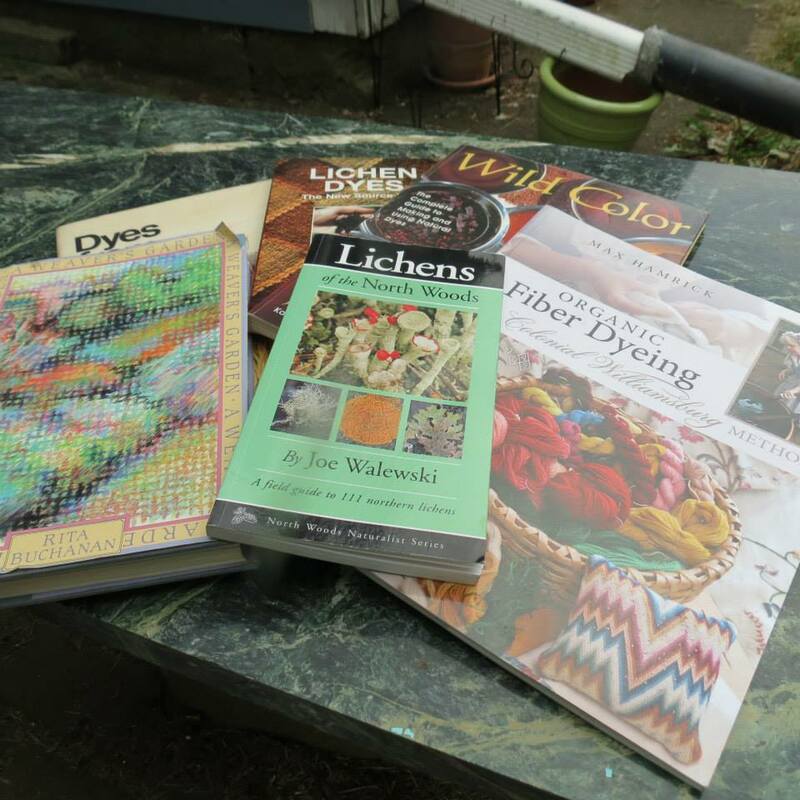 I get to dye! Thanks to my awesome fiber friend and fellow Pennsylvanian, our family finally got to play with some natural dyes with our handspun yarn! 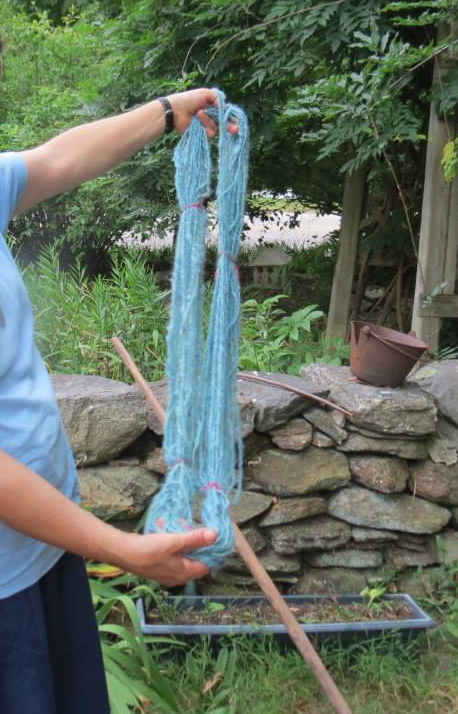 She’s been studying fiber for some time – weaving, dyeing, spinning. And she’s responsible for patiently helping me learn how to spin! It was so cool just going through her books! 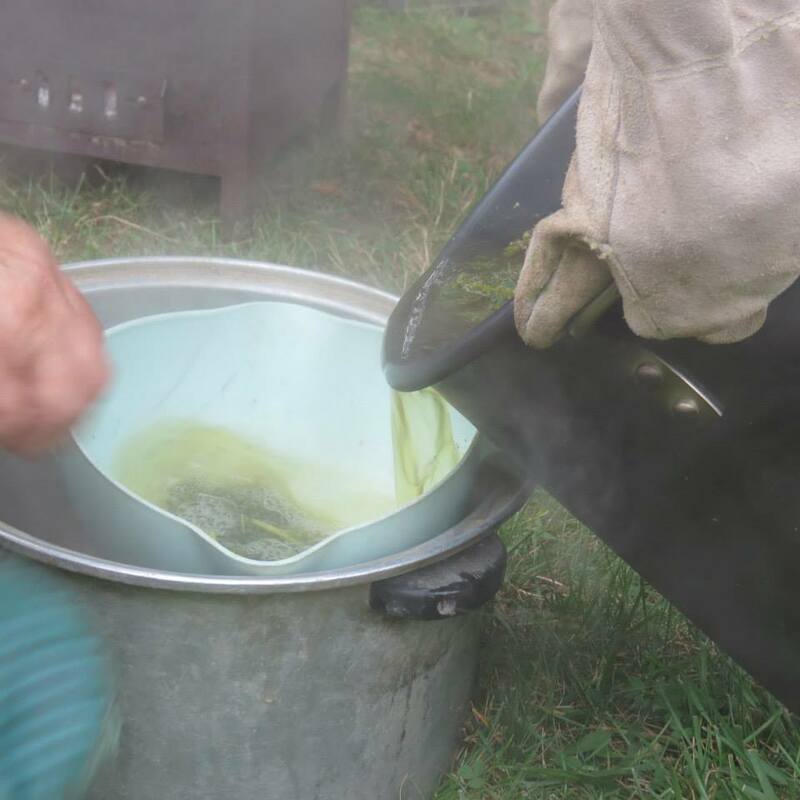 When we arrived, she had the pots out and already had some stinging nettle chopped up in water in a pot, ready to put on the braziers we later fired up. 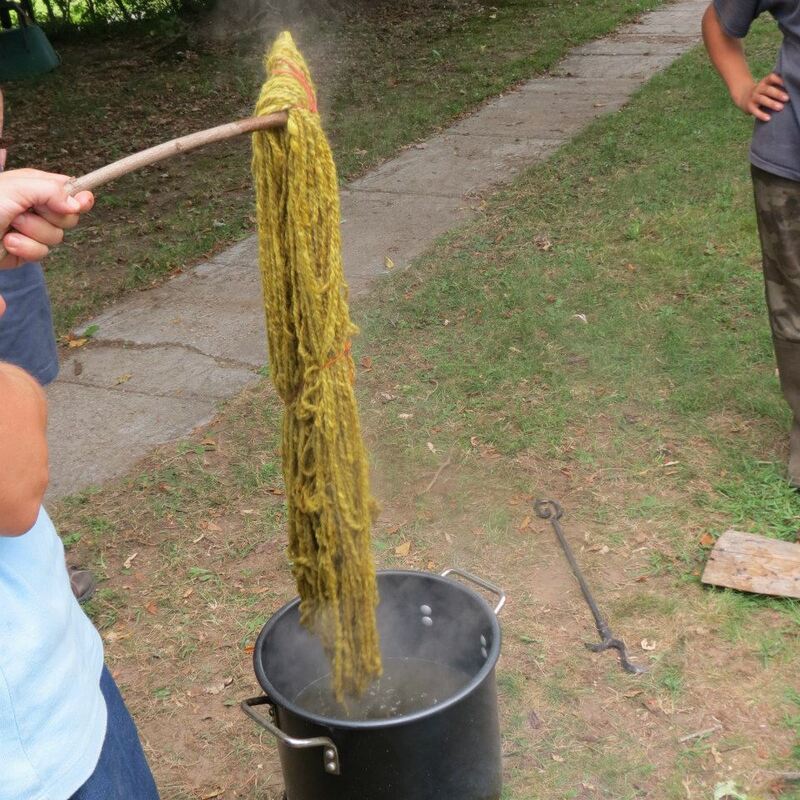 We had the kids collect goldenrod tops for a second dye pot. In an old jar she had a gorgeous purple solution made from lichens she had collected years ago. The beautiful purple pigment, not something you would expect from drab, olive colored lichens, had been extracted using ammonia. I guess in the olden days, urine would have served this purpose! 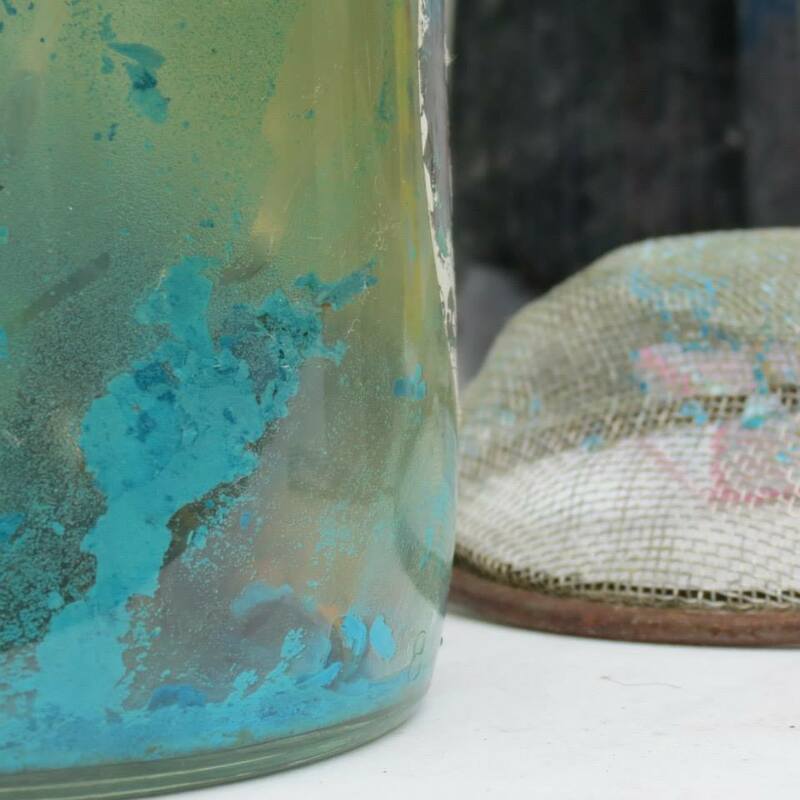 In another jar she had a vinegar solution into which she had placed collected scraps of copper over the years. 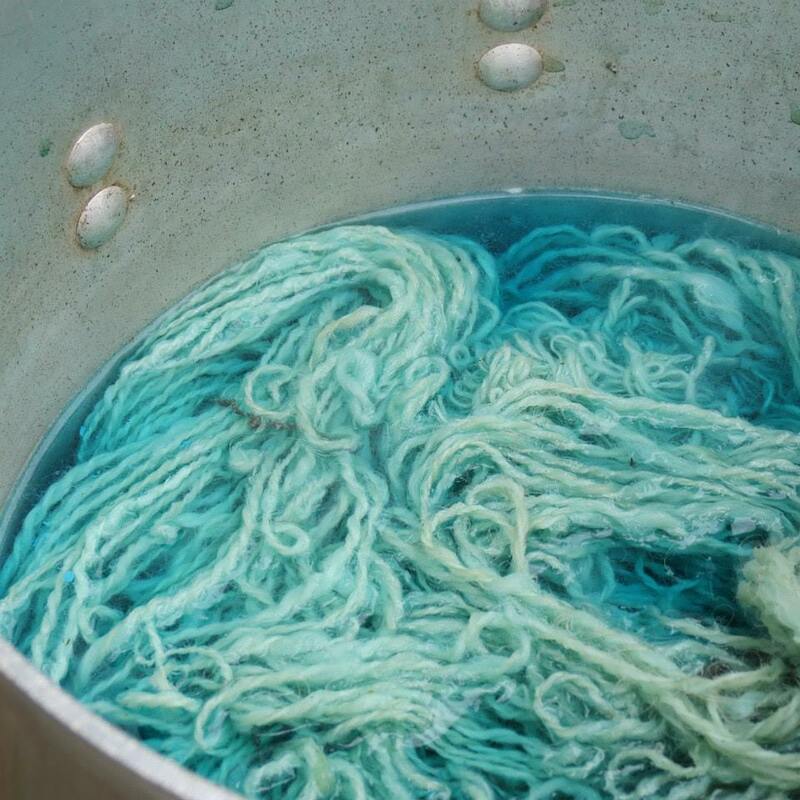 The copper had been extracted and the solution would serve as a mordant for the yarn – a chemical that would help the dye bond to the wool and stay bound to it. The brazier is fired up, ready for a pot. The nettle is ready for straining. 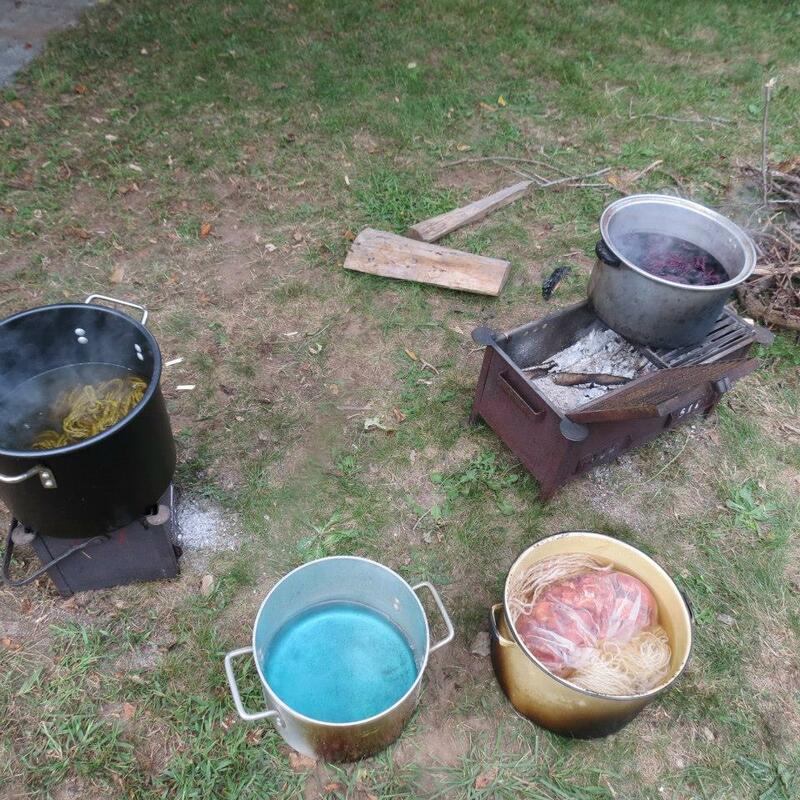 The yarn will go into the dye carrying water bath after it comes out of the copper mordant bath. 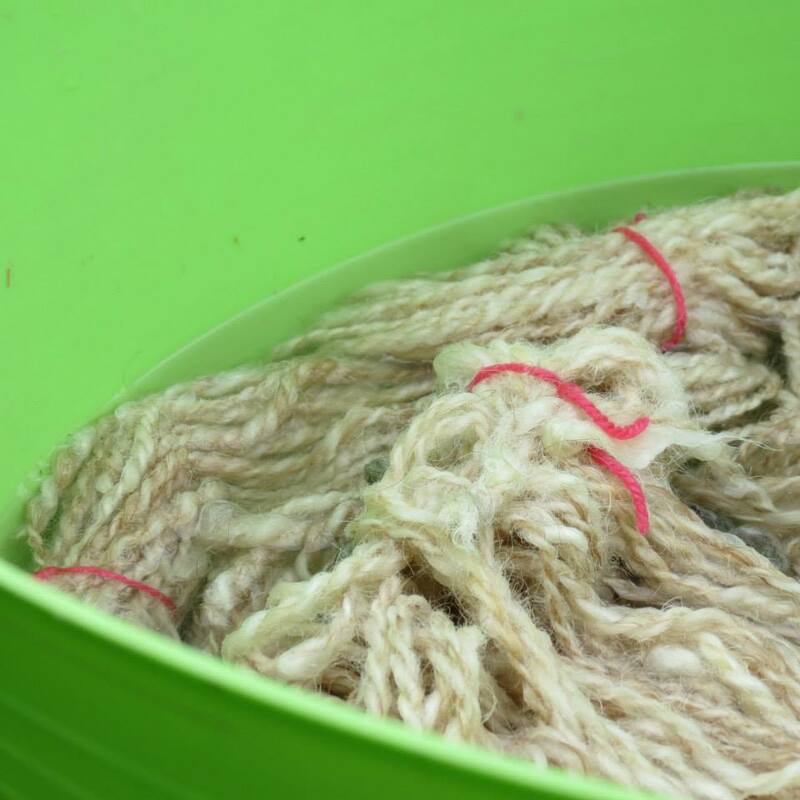 Prior to placing the yarn into the mordant, it was soaked in cool water to thoroughly moisten the fiber. 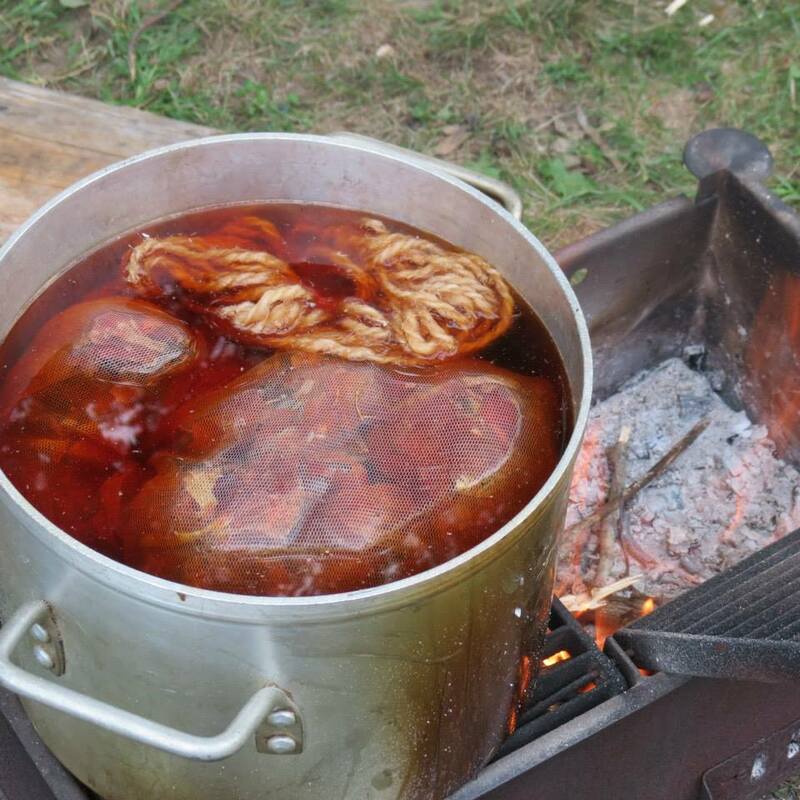 Here is the yarn cooking in the copper mordant bath. 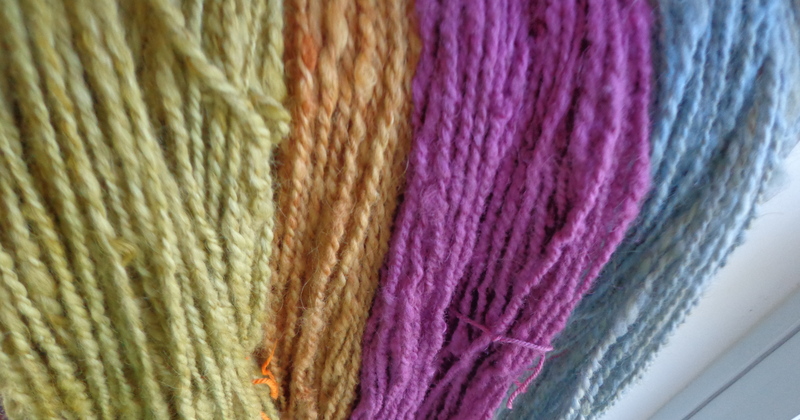 Here is our yarn in the goldenrod dye. We started another skein of yarn in a pot with onion peel. 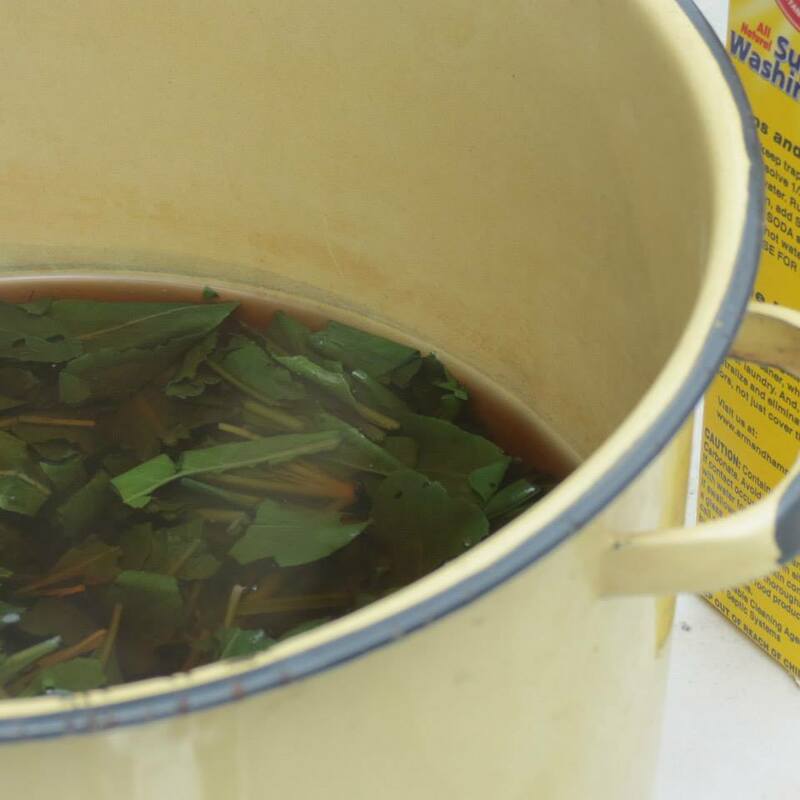 We were experimenting with using the peels without the mordant, so we started them in cool water with the peels and slowly heated the pot. 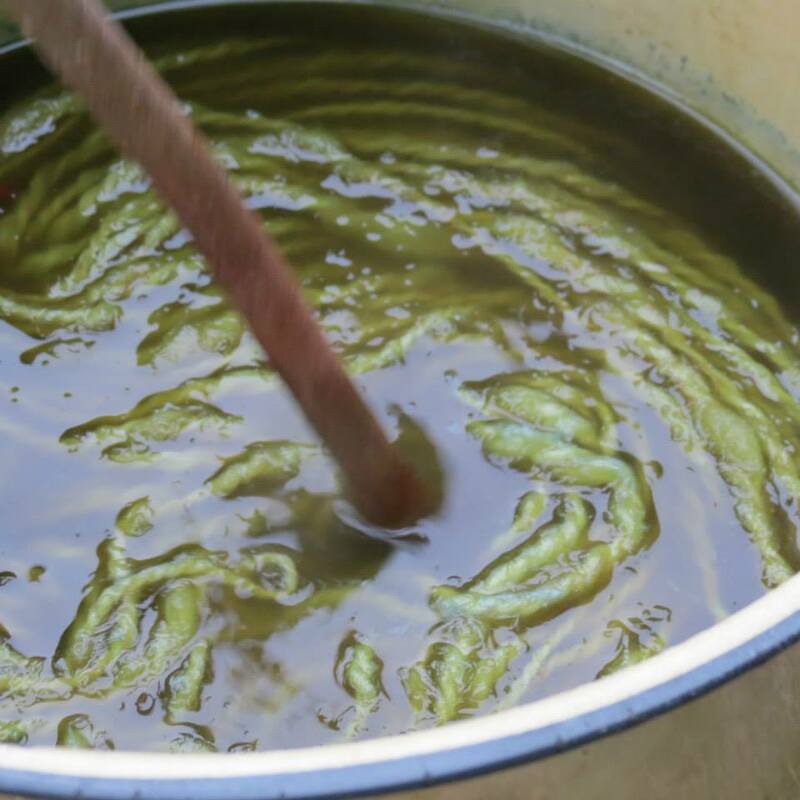 It didn’t seem to be doing much, and we were regretting skipping the mordant bath, but then we came back to the pot after a little while and WOW! What color! And then it was time for the most exciting of the dyes! 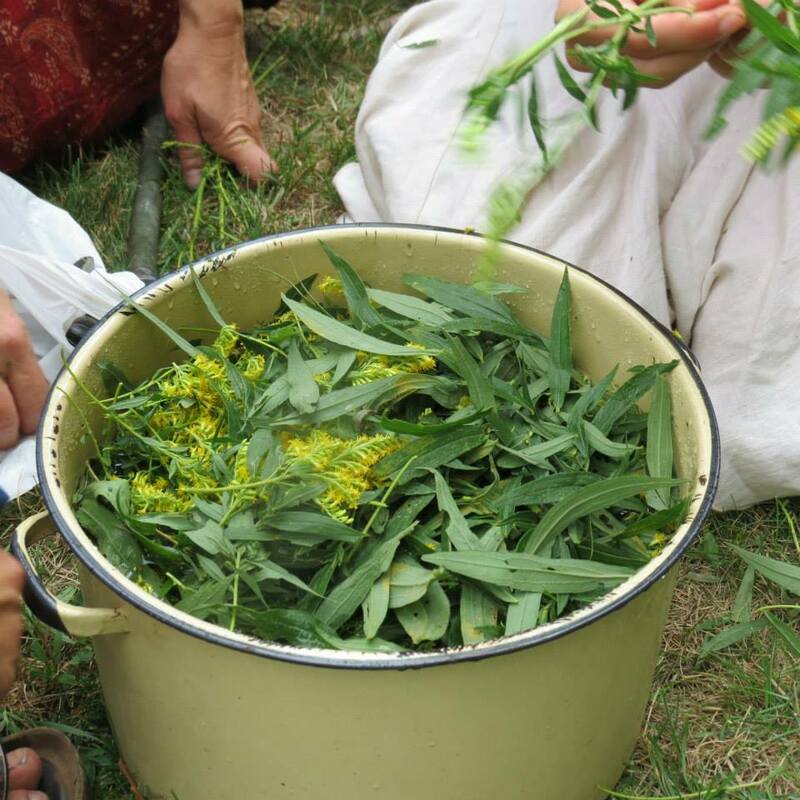 My friend had been growing woad in her yard. 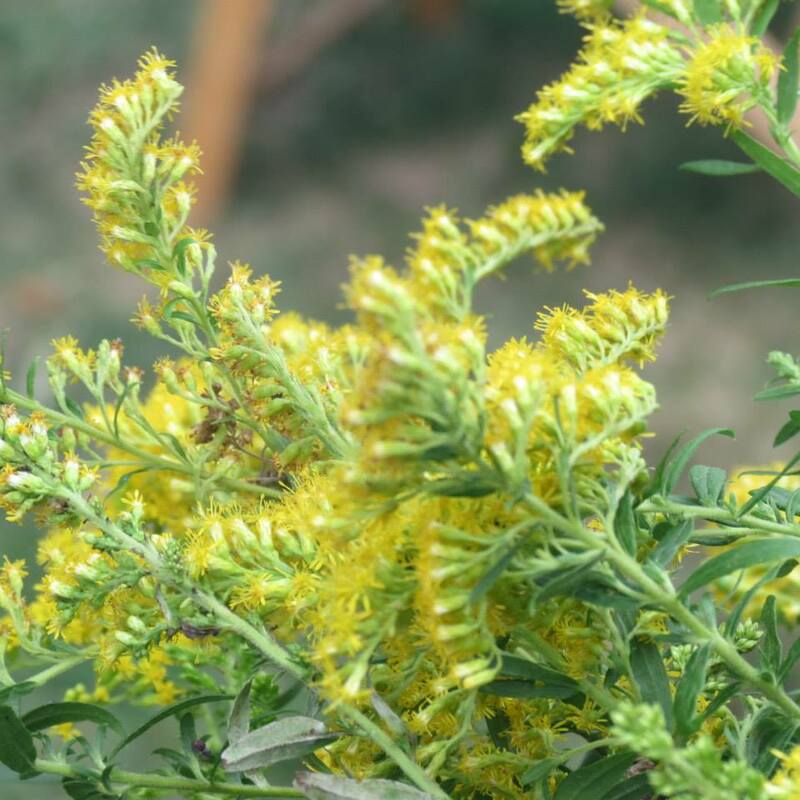 It is a very cool plant with a long and interesting history, but the most awesome thing is that it can be used to create a blue dye similar to indigo. She had the chopped leaves soaking for a while before we came. 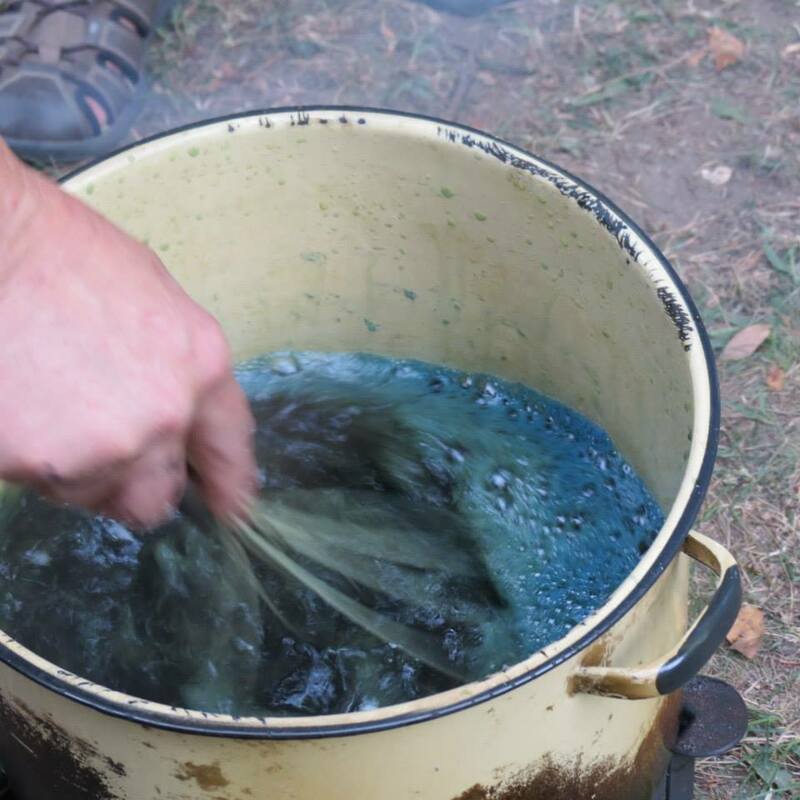 Back to the lichens pot…can you believe this color?!! And back to the woad. Washing powder was added to the strained solution and then it was aerated. 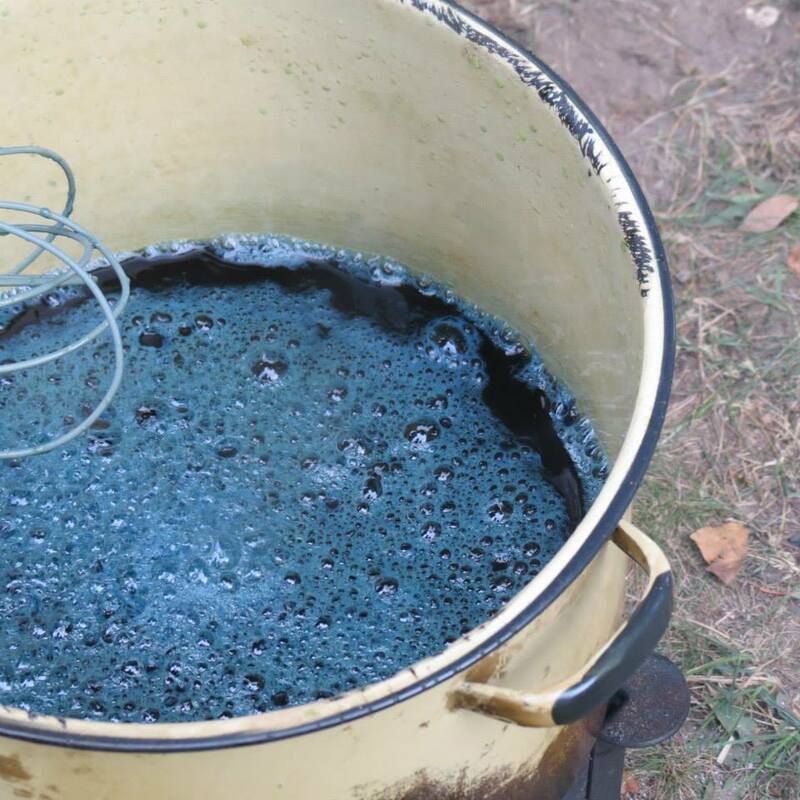 When the yarn was added, it looked like a nasty green color – but the trick is, when oxygen hits this dye, it turns blue! You can actually see hints of blue on the parts of the yarn that have risen to the surface here. 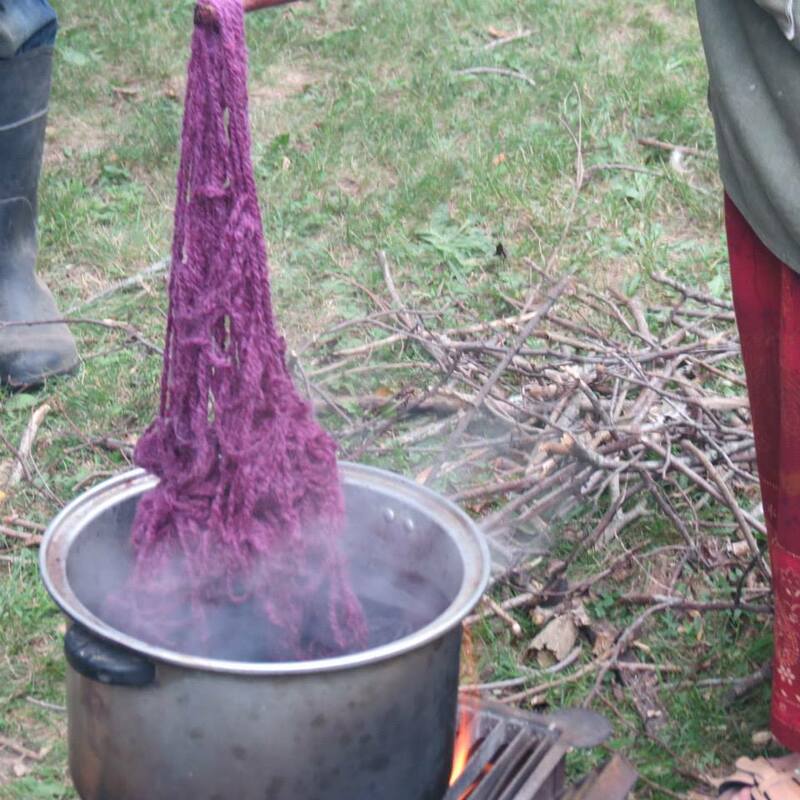 You have to remove the yarn carefully from the solution, minimizing the introduction of oxygen into the dye. 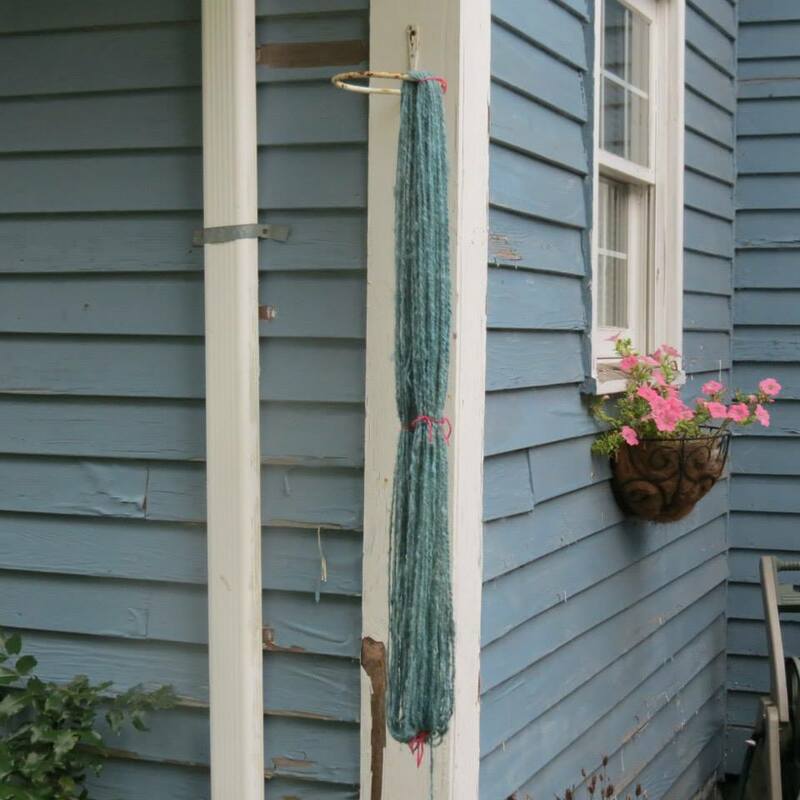 As you pull the yarn out, it immediately begins to turn this gorgeous blue color, right before your eyes! It is truly amazing to me that people figured out all of this chemistry so many years ago to create beautiful colors! 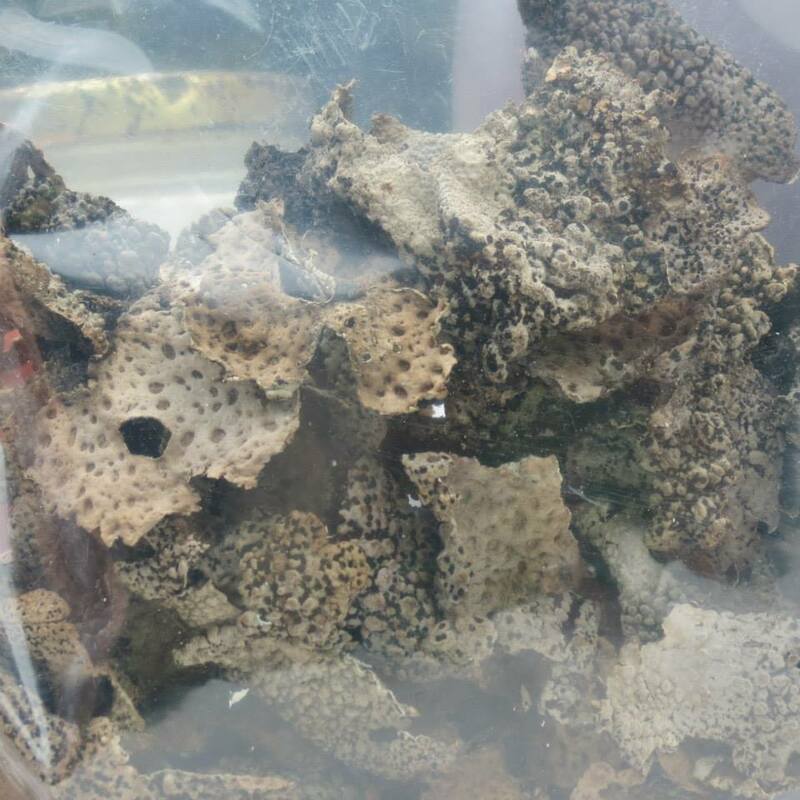 The lichens pot was coming along so well. 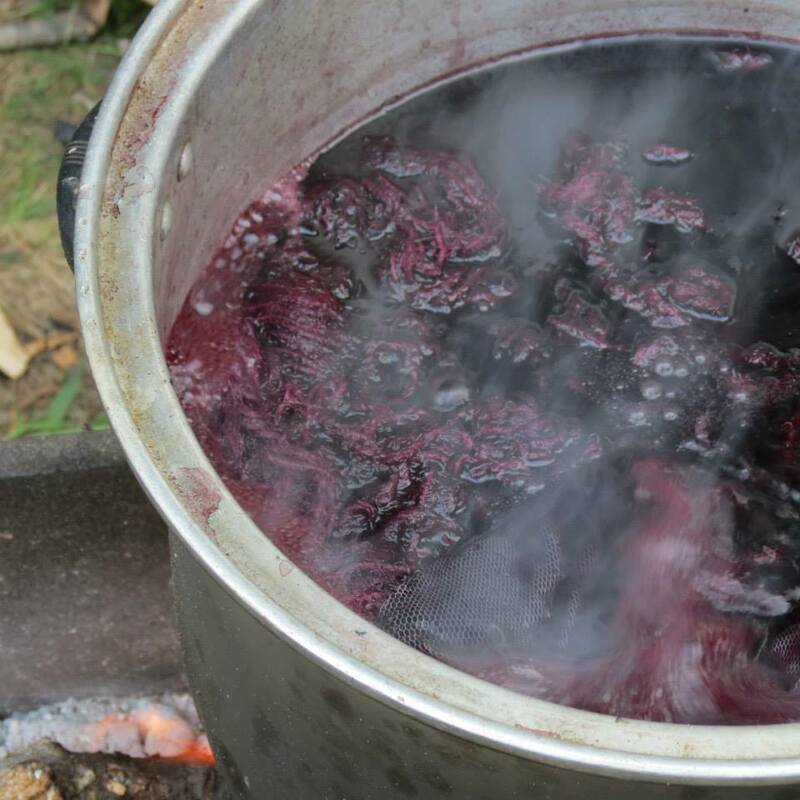 We just let the yarn cool right in the dye pot overnight. And here is the lovely rainbow that followed us home!